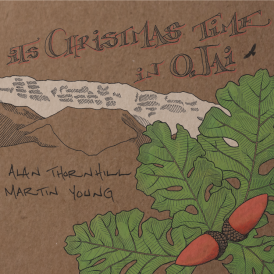 Alan Thornhill’s unpretentious nature could be misleading. You might think upon meeting him that he’s simply the modest legendary finish carpenter from the artist colony of Ojai, CA. That myth evaporates when he picks up a guitar and beautiful hands reveal what they were born to do. Long recognized as a notably brilliant player ( winner of the prestigious Telluride Fingerstyle Guitar Championship,) his distinctive sound has been featured on numerous recordings (Kate Wolfe, Chris Hillman, Hoyt Axton, The Rincon Ramblers and more.) While his melodic playing captivates audiences of all ages, from concert halls to festival stages, it is simply a stunning accompaniment to what is called by many “one of the most beautiful voices ever heard.” Alan’s a singer admired by his peers and beloved by devoted fans and mesmerized first timers. His place among the best was confirmed with the release of his solo album, “Sittin’ Out the Rain.” A spectacular showcase of Alan’s definitive songwriting, guitar playing, and vocal flair, the album, recorded in Nashville and produced by Pat Flynn (New Grass Revival) has been very well-received. 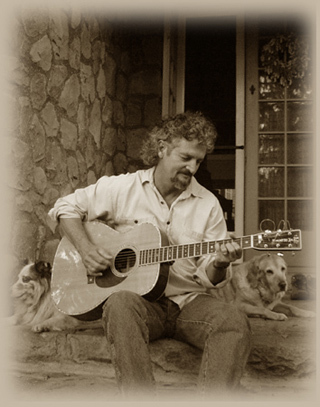 This award winning songwriter (American Song Festival, Mavric Music Awards) has been well-covered by Kenny Loggins, The Desert Rose Band, The Cache Valley Drifters, Chris Hillman, Michael Parks, Jim Messina and others prior to his solo release. Backed up by Dave Pomeroy,Viktor Krauss, Kenny Malone, Stuart Duncan, Al Perkins, and John Cowan, “Sittin’ Out the Rain” has quickly become a favorite with fans and a testament to the talented guitar player, singer, songwriter, ‘guitarpenter’ from Ojai, CA. 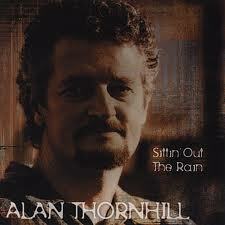 “Sittin’ Out the Rain” has just been chosen the winner of 2008 Mavric Music Awards-Album of the Year. Also chosen was “Lovers’ Question”, Country Song of the Year, and “Martin’s Tune”, Instrumental Performance of the Year. 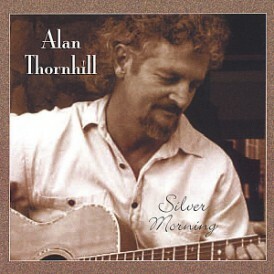 Alan’s next solo release “Silver Morning” is a collection of thirteen original songs produced by Alan and Jim Monahan. The arrangements are more acoustically flavored and allow the artist and his songs to speak for themselves. Along with Alan’s guitar and vocals, “Silver Morning” includes Jim Monahan; Fender bass, weissenborn, and mandolin, Bob Nichols; drums and percussion, Tom Ball; harmonica, Gabe Witcher; fiddle, Randy Tico; fretless bass, Angus Cooke; cello, and Jeff Elliott; flugelhorn. Engineered by Steve Miles, “Silver Morning” was recorded in Santa Barbara and has received enthusiastic response from fans, old and new. Alan’s latest release is ‘Guitarpenter’s Dream’ , an album of eleven original instrumental pieces recorded at home over the past Winter and Spring. Alan had often been asked about recording a collection of his instrumental songs, and ‘Guitarpenter’s Dream’ is just that. Recorded at home , this record has captured the warmth and melodies of his unique guitar style, as well as an occasional crackle of the fireplace, and the warmth of the 1928 stone house where it was recorded. 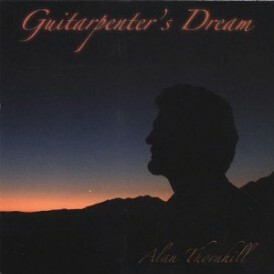 Guitarpenters Dream was nominated for 2008 Mavric Music Awards Instrumental Album of the Year.